The dive site Cleeve's Tunnel is an inshore rocky reef in the Clifton area on the Cape Peninsula, near Cape Town in the Western Cape province of South Africa. The site is notable for the relatively long and fairly tight swimthrough tunnel. Cleeve's Tunnel is named for the diver who either discovered the tunnel or at least made its position known. Maximum depth is about 20m. and the top of the pinnacle is about 3m. Average depth is likely to be about 12m, and the tunnel bottom is from 15m at the north entry to 17m at the south entry, and maybe a metre or so shallower in the middle. Visibility may exceed 20m after an upwelling, but will usually be less. Cleeve's Tunnel is a low and relatively narrow space under a huge boulder pinnacle that stands on an even larger bedrock base at a depth of between 15 and 18m. The local bottom is at about 20m, and the peak of the pinnacle at slightly less than 3m depth. The reef breaks in moderate to rough weather, and probably at low tide in anything less than very low swell. The pinnacle comprises several large rocks and there are undercuts where it stands on the base rock, some of which are quite large overhangs, and as mentioned, in the middle of the formation, the main tunnel extends through from north to south, and is large enough to allow somewhat constricted passage to an average sized diver with backmount cylinder. A map showing the approximate layout of this pinnacle and the position of the entrances to the tunnel is shown. The tunnel is fairly wide to the north, but has low headroom: a diver with a 15l cylinder is likely to touch the top or bottom several times during a transit. The tunnel's southern entrance is at about 17m depth, and the northern entrance at about 15m. The length is about 35m, and the axis of the tunnel is about 040°magnetic. If visibility is good, light can be seen through the tunnel from the south entry from two places, to the east of the opening and to the west. The pinnacle is very shallow on top, where it rises to within 3m of the surface. 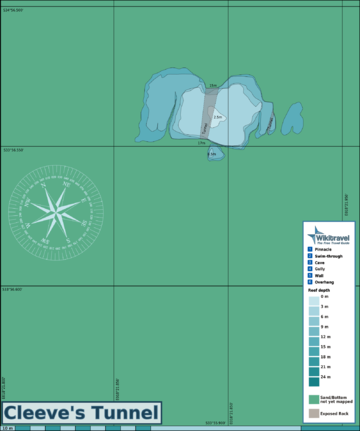 It is fairly large, and is about 45m north to south, and 90m east to west at a depth of 15m. On the south side there is a tall narrow rock a couple of metres away from the main reef, and the southern entry to the tunnel is under the overhang to the west of this rock. This overhang is about 6 to 8m wide, and there is a visible tunnel through on both east and west sides. The west side is known to be sufficient space for an average sized male diver with a 203mm diameter cylinder (steel 15l or 12l dumpy or aluminium 12l) on a backplate and wing harness. The east side is not known to have clearance, and looks tighter from outside. The diver who reported the tunnel also described a dog-leg, which was not found during the survey. this may indicate another route through. At the east side of the pinnacle, another tunnel has been found, also at a depth of about 17m. It is roughly parallel to the main tunnel, but is formed by the triangular space between two large boulders lying on the base rock. This tunnel has not yet been transited, and the clearance is unknown. The north entry is unknown, and the position on the map is a guess. The south entry is not obvious, as it is down a crevice a couple of metres, but once there, light can be seen at the far end. The tunnel looks large enough for a diver, and appears higher than the width, and almost straight. The site is exposed to westerly winds and seas so should be dived when the westerly compnents of the swell are low amd short period, particularly if you are considering a transit of the tunnel as this could be excessively exciting in a strong surge.The site should be good in flat seas during or soon after south easterly winds. The site is well protected from south easterly winds, but if they become too strong the water may become unpleasantly choppy and the ride home will be wet and bumpy. The site is usually at it's best in summer but there are also occasional opportunities in autumn. This is an area which sometimes has upwellings of cold clear water following strong south easterly winds. these will usually be followed by a plankton bloom which will reduce the visibility without raising the temperature. Heavy red bait growth on top, with some kelp. Sides covered with assorted sponges, black mussels, nippled sea fans, multicoloured sea fans, noble corals, sea urchins, west coast rock lobster, solitary and colonial fanworms, arborescent bryozoans and hydroids, starfish, anemones, soft corals and colonial ascidians. Shoals of Hottentot seabream may be seen. The main feature of this site is the tunnel which gives it its name. There are many subjects for macro photography, and if the visbility is good, wide angle could produce interesting results inside the tunnel. The obvious route is the tunnel, but hat is a do it at your own risk route, and the ends are easy to find, so go there, assess the conditions and make your own decision about how to go about it. The rest of the reef is pleasantly colourful and does not have any particular routes at this point. A possibility is to start at the south entry to the tunnel, look into and through it, taking into account the surge conditions and visibility on the day, then work your way around the base and sides of the pinnacle until you get to the north entry, where you can take another look under the overhangs before making your way up to the top of the pinnacle for a safety stop with a view. Just be careful if the surge is strong. Surface downwind/downcurrent from the peak for a safer pickup. There are two significant site hazards. Firstly the pinnacle extends to within 3m of the surface, and will break if there is much of a swell running. Generally if there is a break, the tunnel will be particularly unsafe due to surge currents which could wedge a diver between the floor and ceiling of the tunnel, and there are many places where this is possible. The break is also a hazard to the dive boat, and if the swell is in sets, it may look safe until suddenly a large set comes though and breaks. This would not be a good time for a boat to be over the pinnacle peak. The other hazard is the tunnel. It is low headroom and slopes gradually from the highest parts towards the sides, so the majority of the section has places too low for a diver to fit through, and most of these are gradual reductions in clearance, so it is quite possible to be swept along by surge and wedged in tightly between the roof and floor. This is not a place for inexperienced divers. The tunnel is about 35m long, and the tightest constrictions are about in the middle, quite a difficult place to assist a person who is trapped. The south entry is more constricted than the north side overhang, so it may be advisable to make first transit attempts from the south, as once past the midway point the rest of the way north is relatively clear. Divers should not attempt the tunnel transit unless they are suitably skilled. If you get it wrong, you were not suitably skilled. Large divers should consider low profile rigs if they wish to do the tunnel transit. Sidemounts would probably allow all but the largest to get through, but any transit is entirely at the diver's own risk. This page was last edited on 28 February 2011, at 12:45.